Roller blinds, also known as roller shades, are stylish, easy to use, and functional. If you are looking for a light blocking window treatment, blackout roller shades are an excellent choice. The simplicity of roller shades makes them extremely versatile. For starters, they can be mounted inside the window frame or on the outside. They are simple to operate, with the choice of either a continuous loop chain control or cordless control. Their low profile means they pair very well with drapery. 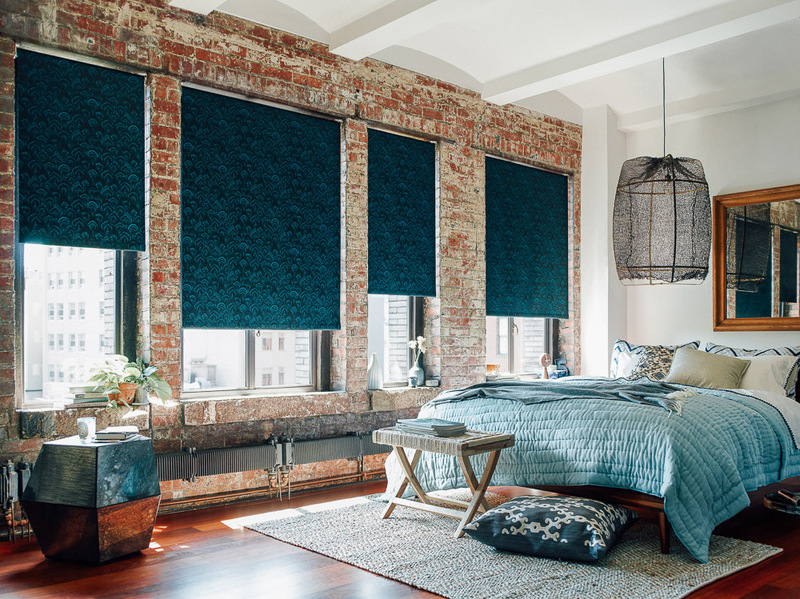 Sheer drapery can be used with blackout roller shades for a gentle, diffused light during the day, and the shades can be drawn at night to provide privacy and block morning light. For a complete light blocking solution, mount your shades under blackout drapes and add a cornice at the top of the window, preventing any light seepage. Our blackout roller blinds are available in sturdy material options that will cut down on heat and reduce the glare from sunlight in your home. This can help make it easier to maintain a consistent temperature indoors. For more insulation, roller shades and drapery again make a functional and beautiful combination. The addition of drapes will help decrease drafts from leaky windows and add to the light blockage from the roller shades. Blackout roller shades are an obvious choice for the bedroom, where a dark, soothing environment is essential for a good night’s sleep. With their clean design, blackout roller shades can be lifted during the day if desired, allowing light to enter leaving the window unobstructed. Blackout shades can also work well in other places throughout the home. In living rooms or family rooms with a TV, blackout roller shades can eliminate glare that can occur on the screen. This also applies to offices or computer rooms, where sunlight can reflect off of computer screens and cause discomfort and distraction. With their opaque material, blackout shades can provide privacy in spaces such as closets or bathrooms. Their minimal, sleek design is ideal for these types of small areas, adding style and protection without overwhelming the room. If you’d like to see our blackout materials in person, order your free swatches today. Begin customizing your blackout roller shades here, or see your shades in your own room with our free Photo Rendering service.